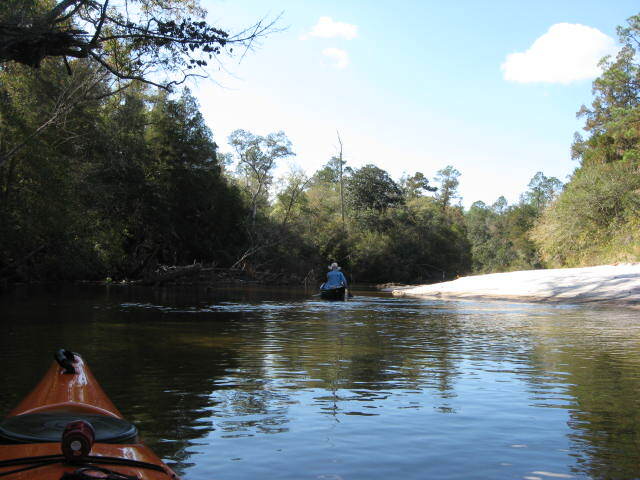 This entry was posted in Blackwater River, Blackwater River State Forest, Paddling on February 9, 2015 by marylynanded. 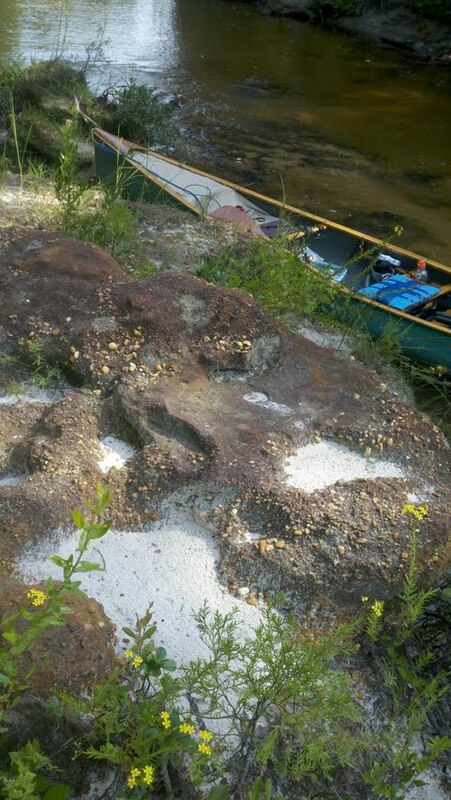 This entry was posted in Blackwater River, Blackwater River State Forest, Paddling on July 2, 2014 by marylynanded. Blackwater Fisheries Research and Development Center…. This is taken from the Florida Wildlife and Conservation Commission web site: http://myfwc.com/conservation/freshwater/blackwater/. For the continuing article, see the link. Blackwater Fisheries Research and Development Center is located in scenic Blackwater River State Forest near Holt, Florida. Constructed in 1938 and operated by the Commission since 1940, the Center has stocked millions of bass, bream and catfish into Florida waters. In recent years, production of fish has emphasized striped bass and striped bass hybrids (sunshine bass) and advanced fingerling largemouth bass. Also produced are black crappie, white bass, and shoal bass. From the years 2000 to 2011 this faciity has produced over 6.3 million striped bass and striped bass hybrids and over two million largemouth bass, bream and channel catfish for stocking in public waters. As a result several notable fisheries have developed. Hatchery produced largemouth bass were stocked into Lake Talquin near Tallahassee for five years beginning in 1999. These bass averaged three inches in length when stocked in the spring. By fall hatchery produced largemouth bass were significantly larger than naturally spawned fish in the lake. October fish samples showed hatchery fish averaging almost nine inches in length compared to just over five inches for naturally produced fish. In addition, angler surveys showed that hatchery largemouth bass contributed from 26 to 39 percent of the fish caught in largemouth bass tournaments on the lake from 2004 to 2006. Hybrid striped bass, something called sunshine bass, produced at this facility have been stocked in many rivers and lakes in Florida to supplement existing fresh water sport fisheries. As a result of these stockings significant seasonal hybrid fisheries have developed in the Escambia, Choctawhatchee, and Apalachicola rivers and Bear Lake in Santa Rose County. Reestablishment of a reproducing population of native striped bass in the Blackwater and Yellow rivers is a joint effort by the FWC and U.S. Fish and Wildlife Service. Earlier this century striped bass virtually disapppeared from both rivers, probably due to pollution of the Pensacola Bay estuary. Releases of young striped bass each year in the Blackwater River since 1987 and in the Yellow River since 1990 have this trophy fish on the road to recovery, with catches of stripers in the 30 pound class reported by anglers. In 1995 the Institute collected the first mature female striped bass weighing 20 pounds from the Blackwater River. Since then over 200 mature striped bass have been collected from the Blackwater and Yellow rivers. Some of these brood fish were brought to this facility and spawned. To date brood fish from these two systems have produced over 7.5 million fry. These fish have been used to enhance or reestablish striped bass populations not only in these systems but in the Apalachicola, Ochlocknee, and Choctawhachee rivers and Lake Seminole and Lake Talquin in Florida as well as other river systems in Alabama, Georgia, Mississippi, and Louisiana. For more information see above web site. 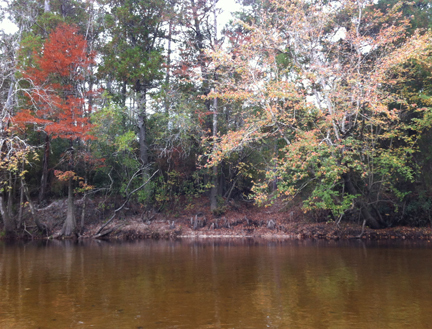 This entry was posted in Blackwater River, Blackwater River State Forest, Fishing, Ochlocknee River and tagged Blackwater River State Forest, Florida fishing on November 21, 2013 by marylynanded. Cotton Bridge landing, December 6, 2012. Put-in. Beautiful white sand beach at the put-in. Rolling down the Blackwater River on a beautiful December day. On a bright, crisp morning in early December, 2012, 6 paddlers gathered at Cotton Bridge on the Blackwater River to begin an overnight paddle. Three paddlers were in kayaks and three were in 14′ solo canoes. All were experienced paddlers, but not all were experienced at spending a night in the woods with only what could be carried in their boats. Each had agreed to participate in the overnight paddle for a variety of personal reasons. The day warmed up and remained bright. A stop for lunch and our group was again on our way. 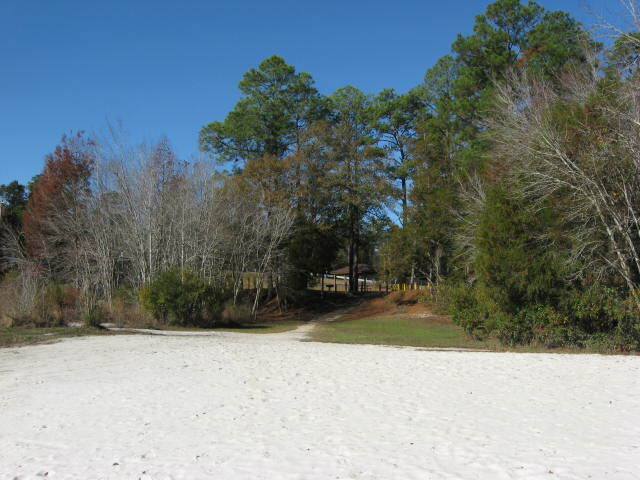 Our goal was to reach a nice big sandbar approximately half way to our next day’s destination at Boat Ramp Road at the Blackwater State Park. We wanted to get to our camp site early enough to set up camp and cook our evening meal before it became too dark. We reached a large sandbar several miles above Bryant Bridge and started setting up camp. Meals were cooked and eaten and then everyone gathered around a campfire to socialize while listening to the night sounds on the river. Setting up camp with lots of sunlight to spare. My canoe, my river, my cup of hot drink — what more could one ask for at day’s end? The following day, after breaking camp and loading our boats, we were again on the river enjoying our passion for paddling and the beauties of nature which can only be seen from a boat. We arrived at our destination, each feeling a sense of personal growth that we had achieved our goal. The next day, homeward bound. Two beautiful days on a glorious river, December 6-7, 2012. 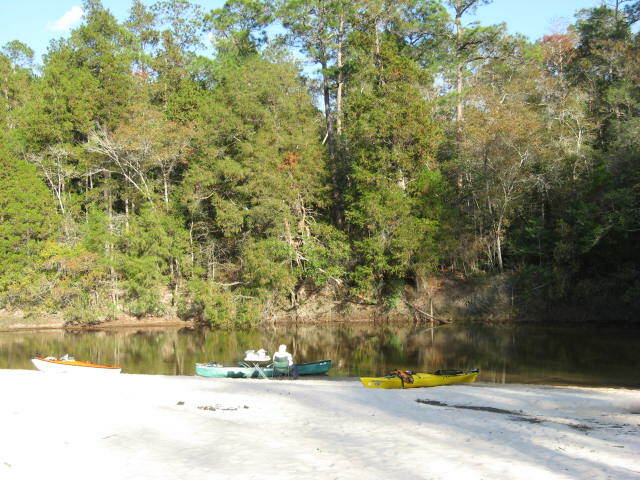 This entry was posted in Blackwater River, Blackwater River State Forest, Camping, Paddling and tagged Blackwater River paddling, Blackwater River State Forest, Blackwater River State Forest camping, Florida Paddling on November 13, 2013 by marylynanded. Blackwater River State Forest has been designated by the National Audubon Society as an Important Bird Area (IBA) with a global priority (the highest). This designation means that this area in Northwest Florida is vital to birds and other biodiversity. It provides essential habitat for the survival of one or more species. 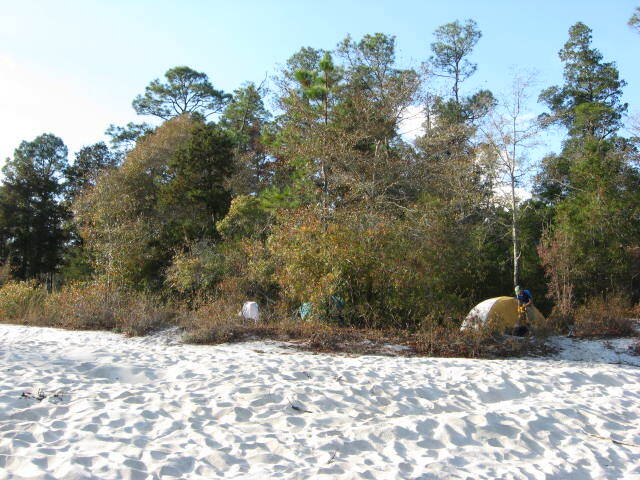 In 2009, Francis M. Weston Audubon Society (Pensacola) undertook the task of surveying the birds in the (Blackwater River State) forest. The team identified 181 different bird species within its 240,000 acres of forest. The number of species of birds seen in the forest varied greatly from season to season. 1) There were 51 species there year around. 2) In addition, 39 more species were seen only during summer months. 3) There were 59 species observed only in winter. 4) There were 32 species of birds seen only during spring and fall migrations. 5) The most species and numbers of birds were seen in winter when 110 species were observed. 6) Ninety (90) species of birds nest and raise young in the forest. The acquisition of the Yellow River Ravine has created a wildlife corridor connecting Eglin AFB, Conecuh National Forest and Blackwater River State Forest. This provides migratory birds a safe and supportive habitat on their journey across the Gulf of Mexico to and from their breeding grounds. This corridor is unique in northwest Florida. During spring and fall migration, 23 species of warblers were identified in small numbers in Blackwater River State Forest. These warblers depend on insects and worms found in oak, pine, beech and a variety of other trees in the forest to help them recover from their long flight across the gulf or to prepare them for the long trip. Other migrants, particularly Wood and Swainson’s Thrushes, were found eating the buds of bay trees during fall migration. The food plots planted for deer and other wildlife attract wintering sparrows in great numbers. Large flocks of Chipping and Vesper Sparrows were present on every winter trip to these plots. Numerous wintering warblers including Palm, Pine and Yellow-rumped Warblers were also found in these plots. These plots provide a very important winter habitat for many bird species. Dead snags left standing have attracted large numbers of woodpeckers. In addition to the Red-cockaded Woodpecker project of the Forestry Department which has been very successful, the forest is the home of good numbers of nesting Pileated, Red-bellied, Red-headed, Downy Woodpeckers, and Northern Flickers. There are a good number of Yellow-bellied Sapsuckers and a few Hairy Woodpeckers in the forest during the winter season. Eastern bluebirds nest in the natural cavities of the dead snags. The Brown-headed Nuthatches are also plentiful in the forest and use the dead snags for nesting. Bachman’s Sparrows, a threatened indigenous species, were heard or seen in eleven of the thirteen survey areas in the forest during the spring breeding season. Southeastern American Kestrels were seen feeding young in a clear-cut area in early spring. Nesting boxes were erected by the FWC (Florida Wildlife Commission) in 2011 and two pair have been documented nesting in the last two years. This sub-species has had an overall decline of 82% in the last 70 years. This nesting evidence is important to the survival of this sub-species. Wood Ducks were seen in ten of the thirteen survey areas during the nesting season. Other migratory ducks were observed in low numbers during the winter season in the lakes in Blackwater River State Forest. Birds that need larger, natural cavities in older oaks are almost non-existent in the forest. There were no Barn Owls seen or heard in the forest. Only a few Screech Owls were heard. Red-headed Woodpeckers, a bird on the national watch list, are present in good numbers in the summer. However they are less abundant in the forest in the winter because their major food in that season is acorns. It appears that there are not enough oaks in the forest to provide enough food for these birds in the winter. Kentucky, Hooded and Swainson’s Warblers were heard and seen in low numbers in the nesting season in the thicket areas along the waterways within the forest. The ponds at the FWC (Florida Wildlife Commission) Fresh Water fish Hatcher located in BRSF (Blackwater River State Forest) attract migratory shorebirds and wading water birds. Bald Eagles sometimes perch in surrounding trees looking for feeding opportunities. Wintering Hermit Thrushes and Blue-headed Vireos have been found in surprisingly large numbers in the pine plantations and in areas of thick undergrowth. Areas in the forest that should attract wintering Henslow’s and Le Conte’s Sparrows have not been located. One sighting of each bird was reported in the food plots. Clearcuts and replanted areas of small (pines) attract birds that prefer tall grasses or short bushes and trees as a nesting site. These birds usually relocate once the new pines reach head height. Yellow-breasted Chats, Prairie Warblers, Blue Grosbeaks and Indigo Buntings were found nesting in planted, pine areas until the trees were about six feet tall. Blue Grosbeaks and Indigo Buntings also nest in clearcuts and grassy thickets. In areas where the Sand Pines have been thinned, the numbers and species of birds increase immediately as they find a food source that was not previously accessible. It is our hope that our findings will impact the management and conservation of this Important Bird Area. Peggy Baker is with the Francis M. Weston Audubon Society and the director of the 3 year bird survey in Blackwater River State Park which ended in early 2012. She attended the Florida Forestry Service Liason (group) meeting in July and attended a meeting of the Florida Forestry Service 10 Year Plan Steering Committee in early August and nothing was reported on the GRASI proposals. She found out about the GRASI proposal at the GRASI scoping meeting in August. This entry was posted in Birding, Birds, Blackwater River, Blackwater River State Forest, Endangered species and tagged Birds, Blackwater River State Forest, Florida birding, National Audubon Society, Threatened species on November 10, 2013 by marylynanded. 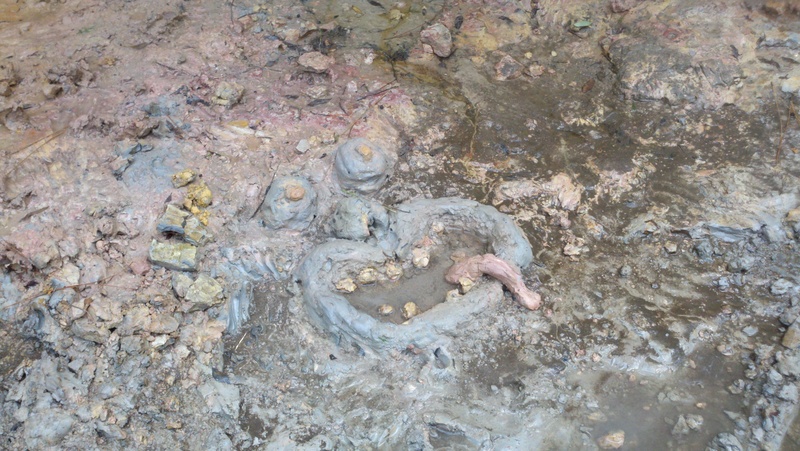 Natural clay in pink, gray, yellow and white. 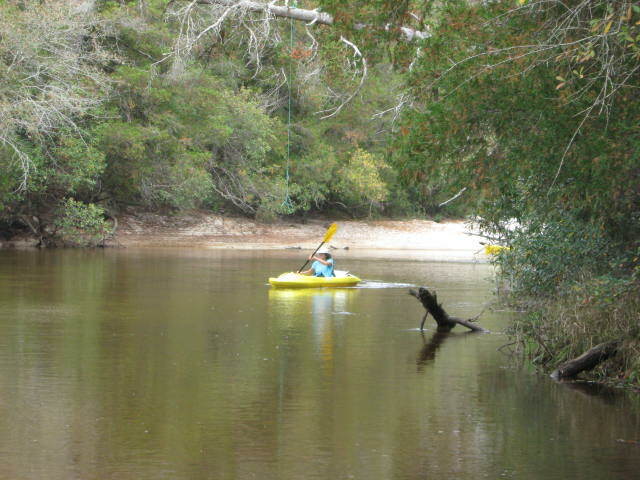 This entry was posted in Blackwater River, Blackwater River State Forest, Paddling and tagged Blackwater River paddling, Blackwater River State Forest, Florida Paddling on November 9, 2013 by marylynanded. Sometimes I like mellow streams where you can float and paddle and even close your eyes to swirl in the currents with no worries, listening to birds and the river’s song. 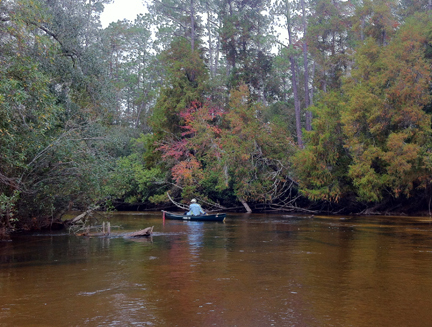 The Florida Panhandle’s lower Blackwater River is one such waterway. A highly popular river in summer and on warm weekends, I chose a Monday afternoon in April. Perfect. The folks at the Blackwater Canoe Rental were accommodating, and they loaned me a serviceable sit-on-top kayak — perfect for floating and jumping out on the numerous brilliant white sandbars for which the river is known. 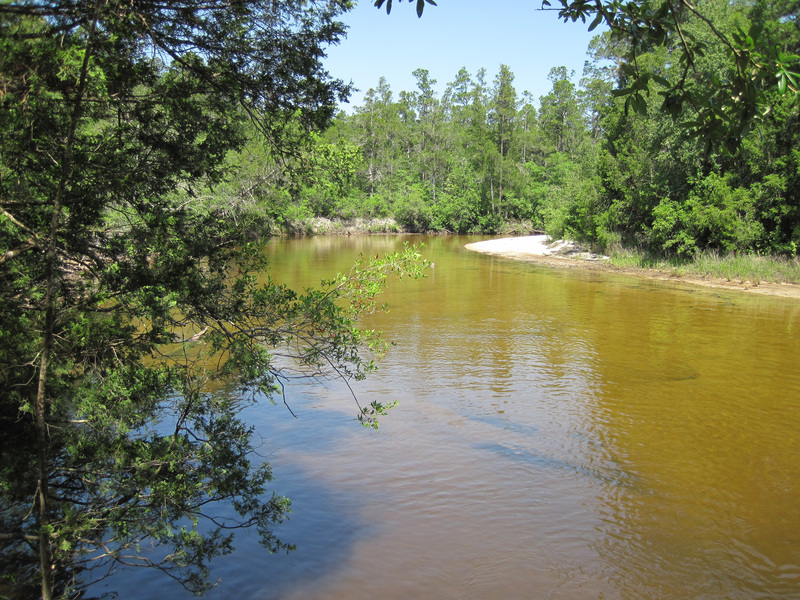 Despite its name — Blackwater, or the original Oka-lusa (water black) in the Muscogee language — the water was a transparent golden-brown. Most of the stream flows through undeveloped lands of the Blackwater State Forest and Blackwater River State Park. The water is as pure as they come, merely tinted with tannins from leaves and roots of shoreline vegetation. No wonder the river is so popular. “I’ve been on all the rivers around here and this is still my favorite,” said Paul Harville, a long-time employee at the outfitter. The business is open year-round, seven days a week in all types of weather. The only time they close is when the river is at flood stage, a rare occasion. Those types of trips make for more interesting adventure stories, but what about the perfect days? I don’t often write about perfect trips on perfect rivers. …it was sunny, beautiful, and the water was refreshing… Snooze. Surely scary rednecks, snakes, alligators, tipping over, storms, bone-chilling cold and such make for exciting stories. But the Blackwater is worthy of mention because it is one of those rivers where you can have a perfect trip when not too crowded — or too cold. River Zen at its best. Other exceptional Panhandle rivers — all of which have similar tannin-tinted waters — include the Perdido, Coldwater, Juniper and Shoal. All have inviting sandbars, although the Blackwater has the largest number. 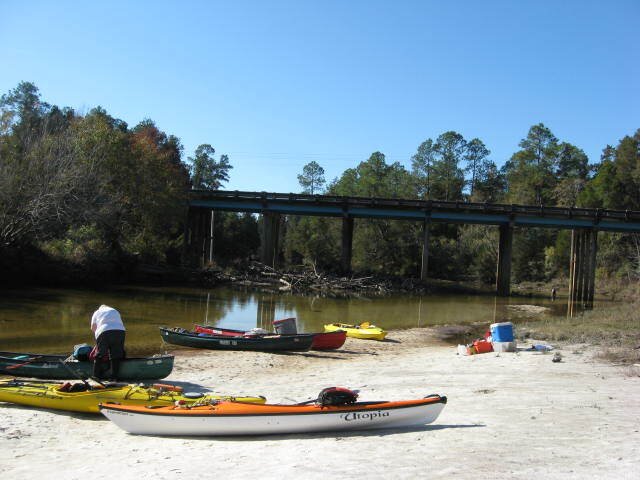 This entry was posted in Blackwater River, Blackwater River State Forest, Paddling and tagged Blackwater River paddling, Blackwater River State Forest, Florida Paddling on November 7, 2013 by marylynanded.